18 minutes is all that it takes to understand Bitcoin better than most people. By the end of this post you will have a good understanding of how hash functions, Public Key Cryptography and Merkle Trees are brilliantly used in Bitcoin. From stickups and drug deals to white-collar scams, cryptocurrency-related crime is soaring—and law enforcement is scrambling to keep up. In an interesting thought-piece from Multicoin Capital, they conclude that over the next few years, we are going to see many crypto-teams get wiped out as competitors (re: Facebook, Google, Amazon) steal all of their technology. Should EOS be taken seriously as a competitor, and will Ethereum (ETH) face tough competition in general from a variety of smart contract platforms in the coming years? In this Deep Dive, Ryan Selkis – a.k.a TwoBitIdiot – takes a jab at Multicoin Capital’s stance on EOS’s performance and usability over ETH’s decentralization and censorship resistance. According to reports, Japan’s Financial Services Agency, a regulatory body, is informally encouraging cryptocurrency exchanges in the country to delist Monero, Zcash, and Dash, all of which are so-called privacy coins. Ethereum, the second-largest cryptocurrency by market capitalization, fell 6% after The Wall Street Journal reported that it has come under scrutiny by regulators. The analysis is based on whether founders of virtual currencies other than bitcoin have any control over their value, similar to how a company’s managers might influence a company’s stock value based on strategy and investments. 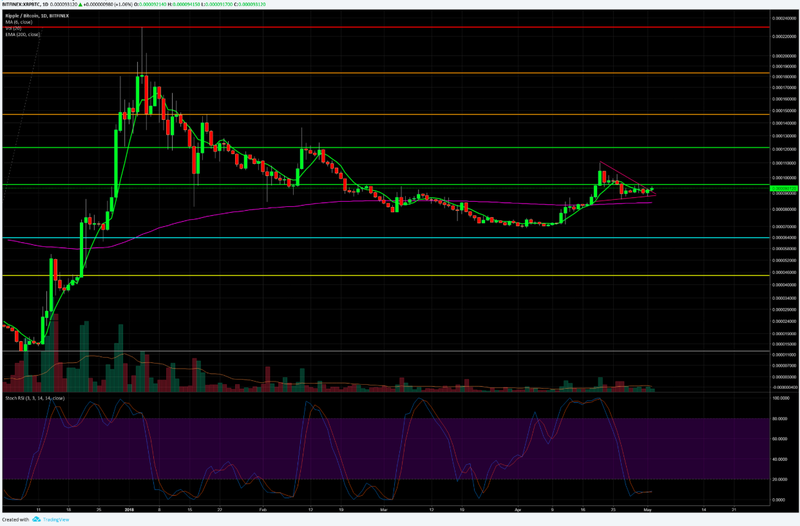 Ripple’s (XRP) RSI is maxed out on the daily and there is a bullish divergence on the hourly. Ripple had smart contracts designed around it’s code base through a project called codius, but was discountinued. Now, they are bringing codius back and we believe this is very bullish news. Ripple labs has also had one of it’s best quarters. These two things are not corollary currently, but the XRP token is starting to get more usage. It may be worth trading in the short-term.